One-Per-Day Tablets are a potent vitamin supplement reformulated to include nicotinamide riboside which supports mitochondrial health. It is a comprehensive nutrient formula that contains up to 50 times more potency than other one-per-day vitamin brands. Purchasing this product today earns you 22 DR Reward Points! 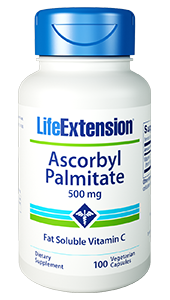 Provides all the nutritional benefits of a Life Extension Two-Per-Day Tablet in one easy to take tablet. Supplements the body with all the essential vitamins and minerals. Contains highest quality, fully potent nutrients. Huge numbers of Americans take a multivitamin, but the potencies of the individual nutrients are usually so trivial that no health benefit is derived. 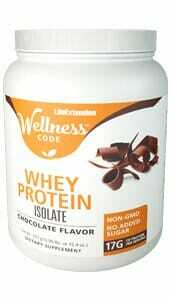 The ultra-low cost of One-Per-Day makes it one of the great bargains on the dietary supplement marketplace. One-Per-Day Tablets are a potent vitamin supplement reformulated to include nicotinamide riboside which supports mitochondrial health. One-Per-Day Tablets provide Crominex® 3+, a highly stable and biologically active form of chromium blended with Capros® Amla and PrimaVie® Shilajit.1 When used as part of a healthy diet, chromium plays a vital role in maintaining healthy blood sugar levels in those within normal range. One-Per-Day Tablets additionally contain alpha-lipoic acid, the universal antioxidant that helps boost glutathione levels already in normal range. 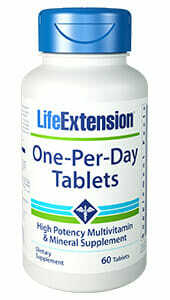 Life Extension’s One-Per-Day formula contains the form of vitamin D known as cholecalciferol (vitamin D3). It also contains bioactive forms of vitamin B2, vitamin B6 and folate, zinc citrate and natural mixed tocopherols. More than twice as much niacin, zinc, and many other nutrients. Life Extension’s One-Per-Day Tablets is among the most potent one a day tablets in the marketplace today, providing the most effective forms of selenium. 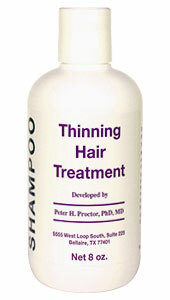 This product also contains vitamin B, chromium, and more to benefit your overall health. Other Ingredients: croscarmellose sodium, stearic acid, vegetable stearate, aqueous film coating (purified water, hydroxypropyl methylcellulose, glycerin), microcrystalline cellulose, maltodextrin, silica. Take one tablet daily with meals, or as recommended by a healthcare practitioner. 1. Int J Diabetes Dev Ctries. 2010;30(3): 153-161.